St Alban’s is strongly connected to the local community and has experienced some exciting changes in recent years with the growth of the 10am service and the planting of a new 6pm service. We're a community of people who have had our lives transformed by the love and grace of God in Jesus. So much so, that we've given our lives over to following Jesus and so we take joy in exploring what this means for us. 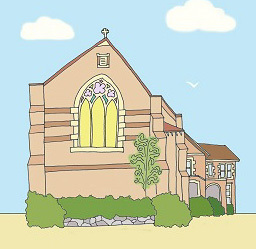 St Alban’s is part of Christ Church Inner West: a wider Anglican church community which also includes St John’s Ashfield and St Oswald’s Haberfield. We enjoy the benefits that come from being part of a larger church - sharing resources and helping each other out - without losing the intimacy that can be found in smaller congregations. Matt grew up in Western Sydney and begins each new year hoping that the Eels might finally win a premiership. He is blessed with a beautiful wife, Clare, and three precious kids. He loves the buzz of life in the Inner West and he is thoroughly convinced that God longs for the people of this city to turn to him and find life that is full and rich in his Son. He's delighted to be part of the St Alban's congregations and is so encouraged by their warmth and spirit; he's convinced God is working in this place and is busting to see what he will do! Megan first loved Jesus as a young child because her grandparents did. Megan's childhood faith grew and matured into a deep conviction of Jesus being the suffering servant and risen king. Megan loves being married to Paul, and with him raising their three fabulous young adults Oliver, Evangeline and Reilly. Megan has too many hobbies to list but include supporting the Sydney Swans and spending regular time drawing, painting and at the gym. She is often struck by the sheer extravagance of flowers which are reminders of God's grace in giving us far more than we deserve. At St Alban's Megan is the Families Pastors seeking to support parents and children in their faith. This includes leading the Kids Church and running the playgroup, Bounce. Megan also works alongside the 6pm community as a co-pastor. Alison has lived in the Inner West for her whole life. She first heard about Jesus from her grandmother and her friends in primary school, and she's been growing in her love for him ever since. Alison trained as a geographer and she loves trying to understand everything in terms of places and spaces. There are some fantastic places and spaces in the Inner West, but she wishes that more people here really understood how much Jesus loves them. Alison, her husband Matthew and her daughter Sophia live in Five Dock and love being a part of the community at St Alban's. Rich Beeston oversees the music teams at the 10am and 6pm services at St Alban's. He loves being part of the Five Dock community, and can often be found chatting, reading and hanging out with his wife and daughter in various local coffee shops. Richard grew up in a Christian home and grew into his faith in Jesus with the help of his family and his high school mates. He studied a Bachelor of Arts and a Masters of Political Economy. After uni he worked on the establishment of a Christian not-for-profit, before returning to uni to complete a ministry apprenticeship with the EU and then completing theological studies at Moore College in Newtown. Richard enjoys hanging out with the crew at The Attic, listening to 1970s post-punk (preferably on vinyl), reading and writing about theology, politics, and economics, and passing himself off as an armchair cricket pundit. Jesus Christ is the very heart and soul of what we are on about, because he is the very heart and soul of what God is doing in the world. He is the one who shows us most clearly what God is like. As we look at Jesus' life in the gospels we see God's power to restore his broken world, his determination to forgive people who have abandoned faith in him, and his humility in giving up his rights for us. In his death we see his great love as he suffers and dies in our place. In his resurrection we see his faithfulness in never giving up on us. Jesus reconciles us to God so that we can know him as our loving heavenly father. And so he brings light into our darkness. He gives hope to the hopeless. He holds out love to the loveless and rest to the weary. He makes dead things come alive. And he reigns forever as the risen Lord of all. And so everything we do at St Alban's has Jesus Christ as the centre: his life, death, resurrection and his ongoing work in the world. Christianity is more about what God has done than about what we must do. In particular, what God has done for us in and through the life and death and resurrection of Jesus Christ. For Christians, although the cross of Jesus Christ is a terrible and desolate scene, it is at the same time the most beautiful part of the Christian gospel. The cross is where we see God himself coming close to us, bearing our guilt, covering our shame, offering us forgiveness and giving him a fresh start at life with him. This is a kindness we didn’t have to earn. In fact we couldn’t earn it - we just receive it as a gift from our loving Father. We call this kindness grace. Authentic Christianity is not about trying to impress God. Which means that we can be completely open with God about our brokenness and our failures, and trust him to mend and forgive us. The bible is the most wonderful true story about God and the way he showers his love on human beings as he creates, provides, promises, comforts, forgives and renews. It is a story which captures both the love and holiness of God as well as the dignity and the tragedy of humanity. The bible tells of the way that God created us with glory to live joyfully, as we depend on God and enjoy his goodness to us. It tells of the way that we asserted our independence from God and opened the door for evil to infect God’s world. And, finally, it tells of the way that God, because of his immense love for us, paid an infinite price to redeem us and restore creation, by sending Jesus to bear our sin in his death on the cross and by raising Jesus from the dead. The bible is the true story of how God has entered our tragedy to restore us to glory with him. It's the most important book we can read. Jesus doesn't just offer life and forgiveness to you alone - he offers it to everyone and he calls us to live it out together. For this reason the Christian life is most fully expressed as people who follow Jesus gather together, sharing life in a community that seeks to love, teach, and strengthen one another - and a community which seeks to reach out with love and life to its neighbours and those in need. At St Alban’s we seek to be a community that is centred on Jesus. For this reason as we gather each week in our Sunday church services we sing of his great love for us, we confess our sins rejoicing that he has dealt with them on the cross, and we read the bible and learn from it together. Because we want his marvellous story to shape everything we do. But our life together isn't limited to Sundays. We seek to love and care for each other throughout the week, both in structured activities such as fellowship groups, as well as in friendships and the myriad of interactions that make up everyday life. We also seek to bless our local community wherever we can. We welcome people from all cultures and backgrounds - no matter what their personality or education or achievements or track record - because God’s invitation to find life in Christ is open to everyone. This means that there is always a place for you at St Alban's. Smooth and efficient administration is vital for any group of people to function well together. Administration of St Alban's, in partnership with St John's Ashfield and St Oswald's Haberfield, is overseen by our Wardens and Parish Council and executed by our office staff. Our church office is based at St John's Ashfield.